About half the states in the United States have been selling tax deeds to the investors since soon after the country was established. Buying tax deeds offers investors the opportunity to get the property well below market value sometimes for only 10 cents on the dollar or less. 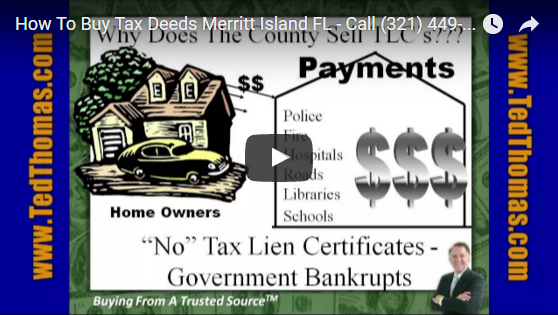 In this next edited video taken from one of my recent workshops I explain in more detail hat a tax deed is and how to buy tax deeds for 10 cents on the dollar. Now to learn more, go to my website that’s at tedthomas.com. All right so once again we look at every house that has a tax every property has a tax so it doesn’t matter and we all talk about houses because we’re also used to that but this applies to office, apartments, buildings, ranch properties, vacant lots, it applies to everything. So there’s always a tax, okay. In that case 250,000 is the value so 1% tax now some could be a little higher than that. So 1% is your general rule but some states if you are in New Jersey they are probably going to be 2% because that’s a very socialistic state and what they do is they charge a lot of taxes but you guys are not familiar with a lot of taxes, right? I can’t believe the hotel the hotels are like three times the cost to be out in the states, you know, you guys really pay a lot of money for it. So the hotels, oh we’d love to have you here and then as soon as you get there, where is your cheque? Wait a minute we just got in the door. No, no, you can’t stay without a cheque. Okay, we got it. Okay so 1% and the tax is always due to the local government so if we say county anybody stepping up here on the platform says county you automatically have to say municipality or county because a lot of you talk more about municipalities. All right, so the taxes they’re going to issue a tax certificate that was unpaid, if it was a deed state what would they issue there? An actual deed so I’m going to change this diagram right now and showing that people didn’t pay so tax certificate so this county and half of the states could actually issue a deed to the property. So watch my hands, half of the states over here are going to sell tax lien certificates that means you just get a piece of paper that you earn interest on. Has everybody got that? The other half of the states are actually going to issue a deed where you’ll end up owning the property, okay, and you’ll hear a lot about owning the property in this class. Okay, who’s going to be the rich people in the future? That’s what I like to hear. Okay, good. Okay, so remember when you buy a tax certificate the government gives you right to receive all your money back, okay. All right we’ll do a couple more slides. All right, now this is the same system in Canada as it is in the States, it’s the same system. What the property tax does is it pays for these things. Now this list is a lot longer than I put up here. For example, the local police are being paid from property taxes, fire department, hospitals, roads, libraries, and whatever other social programs that you might have. So those of you that are property owners who are just probably at least 70% in this room all of you are that are property owners you get that bill these are all the things that are being paid. I you don’t pay those taxes what’s going to happen is they’re going to have a shortfall and they’re going to have to do something with the property. So it’s a good idea to pay your property tax because the government will ultimately take that property. Okay, and so we’ve gone through this before why don’t you know about this and the brokers aren’t going to tell you. So when you went out and tried to explain this to somebody and someone can just yell it out to me if they want to reach on in and I’ll choose a few people. What happened when you tried to explain this to somebody else? What happened? Nice and loud so everybody can hear it. They said it was a scam. Okay, good. I think that’s a pretty normal reaction. What did you have? Okay, good. She said taking advantage of people that can’t make a tax return. Are you taking advantage of anybody? The local government is saying everybody is going to pay taxes, aren’t they? Exactly, yeah, and so that’s kind of hard Okay, what other reactions did you guys get? Over here? Nice and loud. A good reaction. Wow, you got a capitalist friend that is good. There is one of those left in Canada. Wow, bravo for capitalism! Good you got a good reaction. Oh, thank you. Nobody ever says that. You come in front of the class I’ll give you the apple, okay. All right, any other reaction? What other reactions did you guys get? Nice and loud. I can’t hear you. Chasing fantasies, okay that’s good. Young man here, go ahead. Throwing little old ladies out on the street. Okay but is that the case in any of these things that we’ve talked about? I mean the local government is doing this, all you’re doing is you’re helping the local government. Okay, so the banks are the biggest investors and I talk about that a lot because you won’t find the Canadian banks doing it but you will certainly find them in the states and what they do is the bank sees that this long list of certificates and I’ve showed you newspapers that had 40,000 and 50,000 certificates like in Chicago they’ll have 100,000 certificates available. Now until they brought the computers in, this is going to be hard for you guys to believe, but until they started doing this by computer and online bidding it would take them 35 days, 35 days to sell all the certificates in Chicago and that was one county it was Cook County it didn’t count the other counties. It would take 35 days now they put them online so people can buy them in bunches online you can do that. Okay, so these certificates are available anybody can buy them. So what some banks do is they’ll send their representative to the auction to buy as many certificates as they can buy. For example let’s say, go ahead spend 2 or 3 million dollars at the auction buying those certificates because they can earn even if it was bid down if it was 18% so that it was bid down to 12% if they can get 12% of the money and only have to pay you 1% is that a good return for them? That’s why banks are going to do it. But the banks are not allowed to go ahead and buy the properties. They are not allowed to go in and buy these properties they’re allowed to buy tax certificates. The banks can’t buy that property because they had enough of that stuff back because people don’t pay them they get the properties back and repossessions.